This summer marks the 50th anniversary of the release of The Beatles’ Sgt. Pepper’s Lonely Hearts Club Band; The Beach Boys’ Pet Sounds passed that milestone last year. 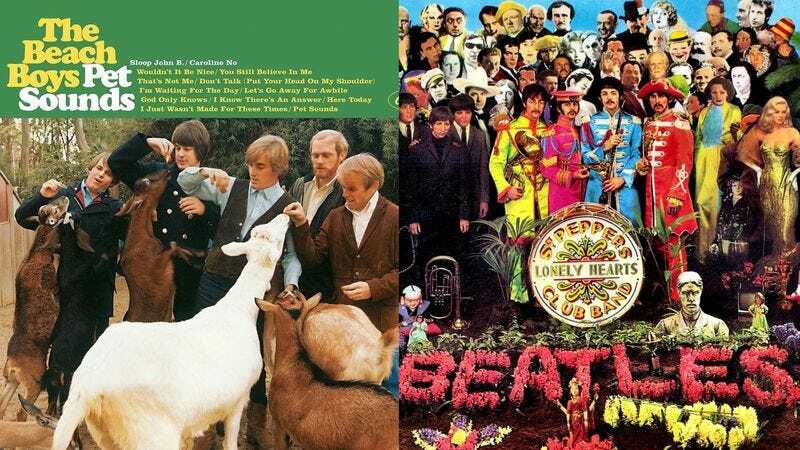 The debate over which of these classic albums is superior has raged ever since they were released, and there is no easy victor on either side, even though most people lean one way or another. Even in our own A.V. Club writers’ room, we found many dissenting opinions. So we put it to you all, the ultimate rock nerd question: Sgt. Pepper’s or Pet Sounds? For me, this isn’t even a contest: It’s a combination of love for Pet Sounds and hatred for Sgt. Pepper’s. Let’s start with the hate: This is not The Beatles’ best album. My own favorite is Rubber Soul; I would also accept Revolver. But on SPLHCB, The Beatles just seem to be in love with their own candy-colored experimentation, exploring the sitar ad nauseam on “Within You Without You” or the endless trippy descriptions on “Lucy In The Sky With Diamonds.” And “Mr. Kite” and “Fixing A Hole” = lame. I recognize “A Day In The Life” as a masterpiece and still appreciate some of the other cuts, like the pathos of “She’s Leaving Home,” but the album is too uneven for all the plaudits it gets. I much prefer Pet Sounds, a more solidified effort focused on Brian Wilson pouring out his troubled psyche all over the recording studio. Has there ever been a song more heartrendingly poignant than “I Just Wasn’t Made For These Times”? Or a more bombastic beginning to a revenge song than the timpani that kicks off “I’m Waiting For The Day”? From start to finish, Pet Sounds sounds of a piece, a poppy but moody collection, where even the cheeriest ode—the irrepressible “Sloop John B” cover—despairs about life on a ship. Pet Sounds is a lovely, pensive album I turn to again and again, especially if I’m feeling a bit insular, like Wilson himself. Pet Sounds forever. On the flip side, Sgt. Pepper’s remains, to me, a testimony to the kind of boundless invention that can happen when you shrug off safety, ignore expectations, and just follow your ideas—and some really good drugs—wherever they might take you. Paul McCartney may have been inspired by Pet Sounds’ unconventional composition and knowingly attempted to match it, but to my ears, Sgt. Pepper’s far, far exceeds it. I get the criticisms, both contemporary and current, of it being too overstuffed, too overloaded with Day-Glo gimmickry, and definitely too overrated, especially in comparison to the rest of the band’s output. I’ll even add that Sgt. Pepper’s boasts my least favorite Beatles song, “When I’m Sixty-Four” (arguably the most cringe-inducing of what John Lennon later derided as McCartney’s “granny music”), and pony up that I’ve always found its alter ego conceit silly, even if the group felt it necessary at the time. But for me, none of this detracts from the overwhelming sense of creativity, a variance in moods and modes that set a standard for the modern album, and that can serve up a music hall melodrama like “She’s Leaving Home” alongside Lennon’s snarky suburban scream “Good Morning Good Morning” and have it all feel of a piece. It’s an album about getting lost in your head, and it’s appropriately, gloriously erratic. Gwen, you complain of The Beatles being “in love with their own candy-colored experimentation” and the unevenness of its structure, but to me, that’s exactly what makes it so endlessly fascinating. And any day in the life, I’ll take an overly, self-indulgently ambitious album that produces songs as insularly weird and wildly different as “Fixing A Hole” and “Being For The Benefit Of Mr. Kite” (counterpoint: not lame!) over a politely revolutionary one like Pet Sounds—no matter what stereo system I hear it on. Both of these albums have meant a lot to me at different points in my life. Getting the Sgt. Pepper’s CD as a Christmas gift was a stepping stone to my life as a high school dork with a Yellow Submarine T-shirt and a dog-eared copy of The Walrus Was Paul. I was sucked into the allure and legacy of the album, poring over the liner notes and badgering my parents with questions about what it was like to be alive when the album came out. (I distinctly remember asking my mom, “Did you think it was by a band that wasn’t The Beatles?” Because I was an idiot.) For years, I held the opinion that “A Day In The Life” was the pinnacle of recorded music, an impassioned defense of which helped secure a job at my college newspaper—by which point I was similarly obsessed with Pet Sounds, having picked up a vinyl copy in (of all places) the gift shop at the Rock And Roll Hall Of Fame. Here’s where I out myself as a musical philistine: I’ve never given Pet Sounds the full, deep listen that adherents to the Holy Church Of Brian Wilson, Music Saint, have repeatedly assured me it deserves. But as fond as I am of a few individual songs on the album—I’m never going to kick “Sloop John B” out of bed—it loses me for the same reason that Gwen champions it: Every song is just too similar to the one that comes after, and the one that came before. The tracks themselves are frequently beautiful, but my craving for variety rejects something that operates from such a limited range. Way back in 2009 I wrote about how, every few years, I give Pet Sounds another shot. I have gone my whole life being unmoved by its many supposed charms, but I figure one of these days it’ll click. It’s a masterpiece, right? People whose tastes and opinions I respect greatly will sing the praises of Pet Sounds with religious fervor, and for a long time, that left me feeling like a heathen. But years later, I still think Pet Sounds is… fine. I never put it on willingly, but I don’t go into convulsions if I hear it. (Put that endorsement on the cover.) All of that would lead you to believe I’m team Sgt. Pepper’s, right? Well, I am, but not zealously. In fact, up until a few years ago, the only Beatles album I owned was Abbey Road, and I never listened to it. I wasn’t a Beatles fan growing up, even though I respected their status as pop icons and huge influences on many artists I love—including bands that affected me far more than The Beatles. What changed? I got all the albums when they were finally released digitally, and last year, I picked up the mono CD set. The conspicuous panning on their stereo mixes always annoyed me, so I figured mono may sound better to me. It did, but I still didn’t play the albums much. Then this past January, my 4-year-old discovered Netflix’s Beat Bugs—which I recently wrote about—and watched it obsessively. If you’re unfamiliar, each episode takes its title from a different Beatles song, which the cast and special guest stars sing at some point. It’s very charming, and my daughter’s interest in the music prompted me to start playing Beatles albums at dinner. Each night we play a different one, and now it’s one of my favorite things that we do. My daughter loves the “Sgt. Pepper’s” episode of Beat Bugs, so she gets excited when the album starts. I don’t know that it’s The Beatles’ best album, or my favorite, but it’s up there. I don’t find it self-indulgent like Gwen does, and I think its mix of psychedelia, straightforward pop, studio experimentation, et al. perfectly reflects where the band was at the time. I’ve played Sgt. Pepper’s at least a dozen times this year, unlike Pet Sounds. Maybe an animated Beach Boys kids’ show will Stockholm-syndrome me into loving Pet Sounds. There’s still time. But then, when I was 18 and knew enough to fake my way through conversations on a wide range of cool and difficult music, I found myself selling CDs for a living alongside older and more tattooed cashier snobs who threw around Pet Sounds as a point of comparison with intimidating authority. So I decided to finally give it a serious listen. Now, I remember around this time reading a first-person-ish thing about crack in which the author wrote of the first elated high and how every subsequent one was an attempt to repeat it. That’s me in my crappy basement bedroom, aged 18, as “Wouldn’t It Be Nice” butterflied out from the speakers. It was just the most beautiful thing, one of those moments of late discovery where everything just falls into place. To me, the difference between Sgt. Pepper’s and Pet Sounds is one of reach and grasp. Sgt. Pepper’s is trying all kinds of things (some goofy) that go beyond the bounds of what popular music had been just a few years prior, whether we’re talking multi-song suites, Indian instrumentation, or stuff that’s too old-timey or too psychedelically far out. It has little mid-ground as an album, and that’s great. But Pet Sounds is the teenage subject matter of the early 1960s at its most perfected and majestic; it’s about very simple and sometimes childish things in a richly sophisticated way. In short, Pet Sounds all the way. Here’s my hot take: I like neither The Beatles nor The Beach Boys. Do I recognize and appreciate either band’s upending pop music from bubble gum to nuance and sophistication? Surely. But I never felt the compulsion to listen to Sgt. Pepper’s or Pet Sounds front to back more than once. My dislike for both albums stems from the most minute, nitpicky reasons: I hate how on Pet Sounds, all the songs end on a fade-out, which has always felt like a songwriting cop-out. And with Sgt. Pepper’s (and, really, with most Beatles albums), every time Ringo Starr does his signature in-between-lyrics drum fill on the toms, it sounds outmoded and passé—which in the end, is how I feel about The Beatles at large. Someone—I wish I could remember who—once wrote that Sgt. Pepper’s Lonely Hearts Club Band is the best album of all time that no one actually likes. Now, you’ll find plenty who beg to differ, including several of my colleagues here. Hyperbole aside, I think that paraphrased bit of snark gets at my gut reaction to this hall-of-fame classic: Sgt. Pepper’s is much easier to admire—for its innovation, for its influence, for the Beatles’ willingness to keep stretching their sound in brave new directions—than it is to love. In other words, understanding an album’s importance and feeling a burning desire to actually listen to it are two very different things. And there’s pretty much never a time that I don’t want to listen to Pet Sounds. Right from the heavenly opening chimes of “Wouldn’t It Be Nice,” the Beach Boys’ 11th studio album is pure pop bliss: one golden melody after another, talking to each other through harmonized voices and the gentle, perfectly recorded lilt of the instruments. For Brian Wilson, Pet Sounds was its own quantum leap forward, but its experimentation—that futzing around with what, exactly, a Beach Boys song could be—never comes at the expense of its supernova pleasures. It’s the kind of record that takes multiple listens to first hear in its entirety, because you keep backtracking to the start, wanting to listen to every new song on repeat. Sgt. Pepper’s just doesn’t hold that kind of compulsive appeal to me. Let it have its top spot in the canon. Pet Sounds comes first in my heart and on my stereo.